Complete the look and feel of your living room with this functional and fashionable loveseat. The perfect complement to your full-length sofa, this stationary loveseat is great for furnishing tighter areas of the room. Spacious enough for one person to sprawl out or two people to snuggle closely, this item makes for the perfect date-night setting. From sleek leather upholstery to 1.8 density foam cushions and accompanying accent pillows, this item is designed to offer the comfort and support you need to truly relax. But also stylish, rolled arms, bun wood legs and subtle stitching detail exude a rustic yet traditional vibe that will set the tone of any room. The Axiom - Walnut Traditional Stationary Loveseat with Bun Wood Feet by Signature Design by Ashley at Lapeer Furniture & Mattress Center in the Flint, Michigan area. Product availability may vary. Contact us for the most current availability on this product. Fabric Options Available as shown in Walnut color. Frame Construction Constructed of solid wood lumber. Corners are glued, blocked and stapled. Seats and back spring rails are cut from 7/8" hardwood. All metal construction to the floor for strength and durability. Padding & Ergonomics Fully upholstered seats feature cushion cores that are constructed of low melt fiber wrapped over 1.8 density, high quality foam. 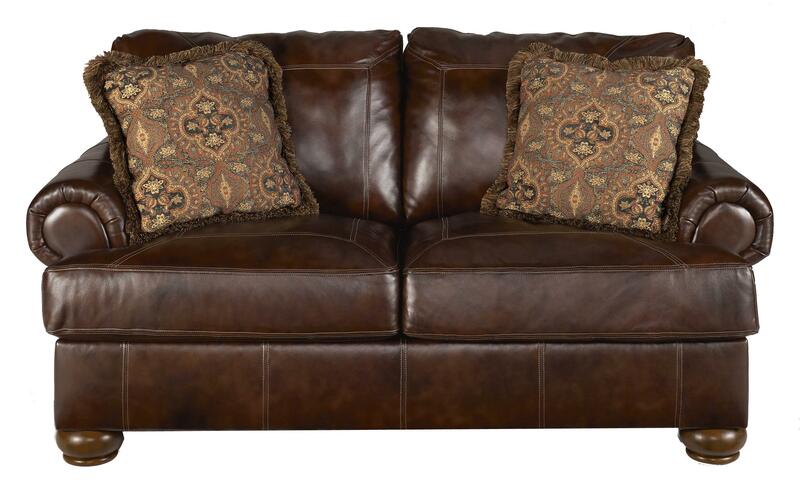 Rich in style and exceptional in comfort, the Axiom - Walnut collection is truly one-of-a-kind. 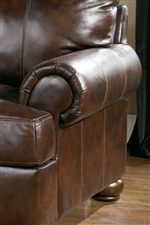 With genuine leather upholstery covering 1.8 density foam cushions, each item in this collection wraps your body with the soft support it needs to relax. But where style is also key, rolled arms, bun wood legs, and decorative throw pillows accented by fringe welt detail exude a rustic yet traditional vibe that will bring antique-like charm to any room. Complete with a stationary sofa, loveseat, chair-and-a-half, and ottoman, the Axiom - Walnut collection has everything you need to make yourself at home. 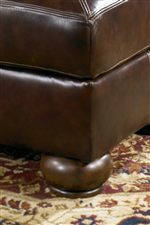 The Axiom - Walnut collection is a great option if you are looking for Traditional furniture in the Flint, Michigan area. Browse other items in the Axiom - Walnut collection from Lapeer Furniture & Mattress Center in the Flint, Michigan area.